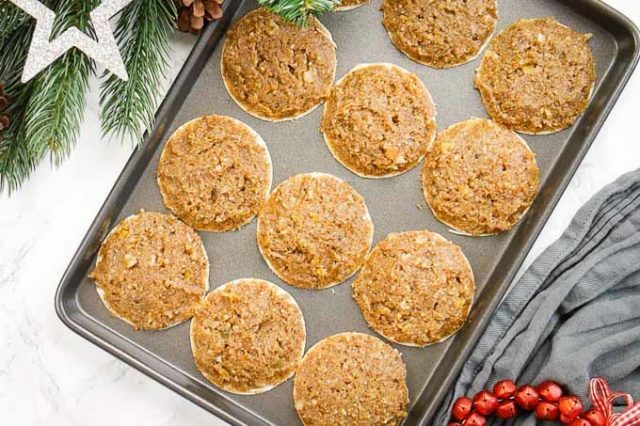 This traditional Lebkuchen recipe is easy to make from scratch and loaded with nuts, candied fruit, and flavorful spices. 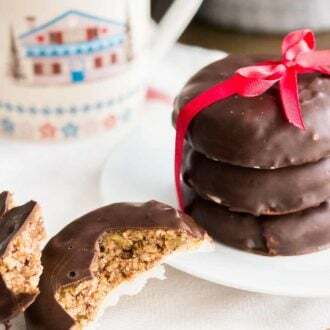 Elisen Lebkuchen (German Gingerbread) are one of the most famous German Christmas cookies with their moist and soft interior and make a great edible gift during the Holiday season! 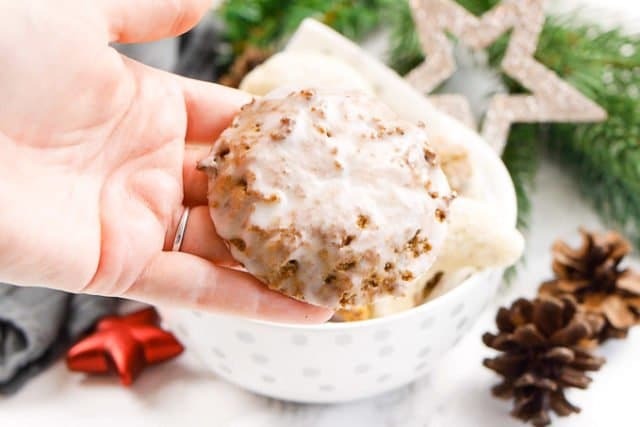 There are many different varieties of German Christmas Cookies like Vanillekipferl, Nut Corners, and Cinnamon Stars but these traditional Nuernberger Elisen Lebkuchen are a Christmas favorite! Lebkuchen are the most famous German Christmas Cookies! German Gingerbread is soft and moist, unlike the hard gingerbread that is known in North America. 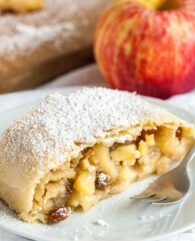 It is made with nuts and a special spice mixture called Lebkuchen spice that is similar to Pumpkin Pie Spice and gives them their unique flavor. 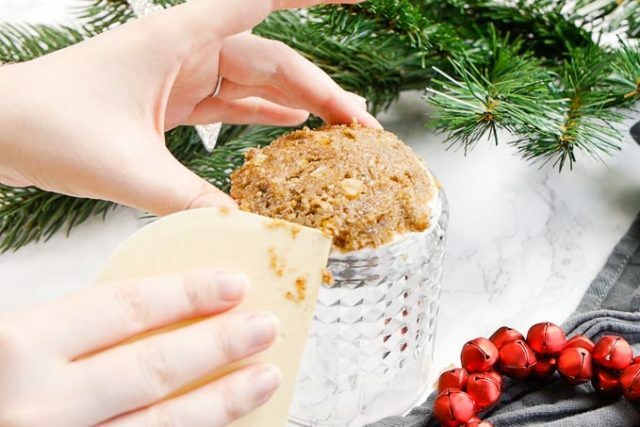 The best thing about these treats is that can be made weeks before Christmas because they keep fresh and moist for a long time stored in a cookie tin in a dry and cool place! Lebkuchen are traditional German Christmas cookies that somewhat resemble gingerbread. There are different varieties of Lebkuchen, Oblaten Lebkuchen and Elisen Lebkuchen, which are made with different amounts of nuts but the main ingredients are always a mixture of nuts, candied orange and lemon peel, eggs, sugar or honey, and sometimes marzipan. What makes the famous Elisen Lebkuchen so special is that they contain no flour! These are my favorite Christmas cookies! A few years ago I started to make them myself after finding out how easy it is. 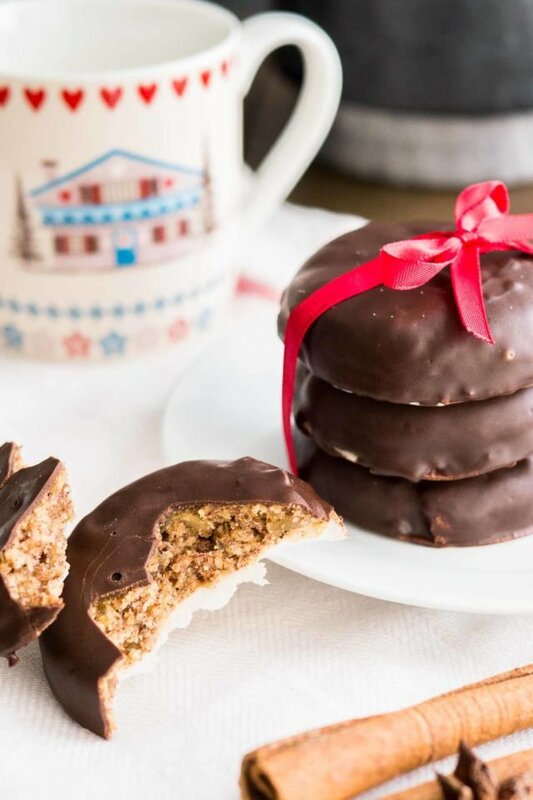 This recipe makes a big batch of Lebkuchen, enough to share with friends and family. Instead of buying ground almonds and hazelnuts, use whole nuts and process them in a food processor until they resemble coarse crumbs. In my experience, this makes the best Lebkuchen because the nuts taste fresher and are moister. Candied fruit is not everyone’s favorite but this adds flavor and moisture. Don’t leave it out! You can buy the baking wafers online or in Specialty Food Stores that carry German food. They are very similar to Communion Wafers which you get in church and are called “Backoblaten” in Germany. If you can’t find the wafers you can make these cookies without wafers. 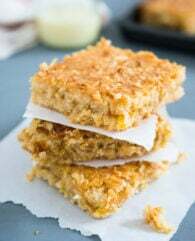 Use a silicone baking mat instead of parchment paper and place the batter with an ice cream scoop directly onto the mat. Use a wet knife or bottom of a glass dipped in water to flatten the batter. Dip the bottom of the Lebkuchen in Chocolate after they are cooled completely. There is no substitution for the Lebkuchen Spice Mixture! It is easy to make your own just follow my recipe. Lebkuchen keep fresh for about 3-4 weeks stored in an airtight cookie tin in a cool and dry place. Start with beating the sugar and eggs together until they are light and fluffy. The color of the mixture will get paler and the volume of the mixture will double while you mix it. A stand mixer works best for this! Then add all the other ingredients and mix until well combined. The German Gingerbread Spice Mix is very easy to make yourself but you can also buy it in some Specialty Food Stores that carry German food. Cover the bowl with plastic wrap and put it in the fridge overnight. After resting in the fridge for at least ten hours, the Lebkuchen batter will be thick and have a texture like really thick porridge. It should be spreadable and keep its shape when you scoop it into balls.
) 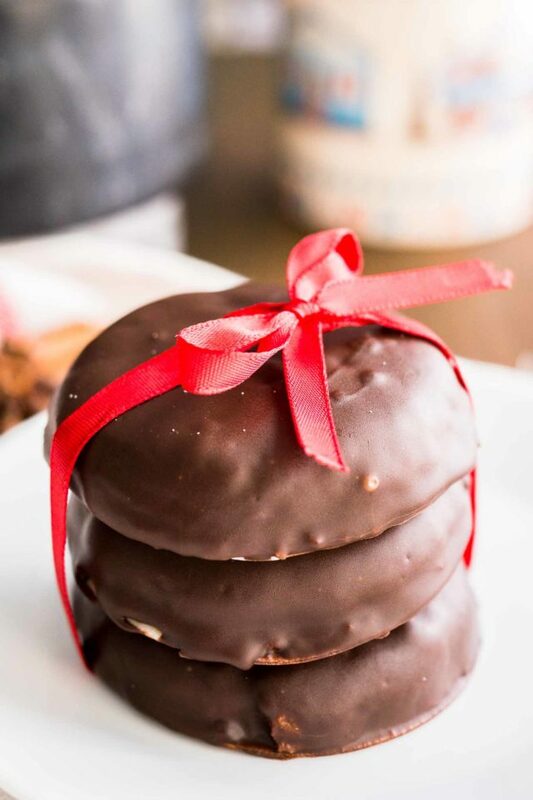 upside down, put one of the baking wafers on top and scoop about 3 Tablespoons of batter on it and use a knife or dough scraper to shape the Lebkuchen. Watch the video below to see how I do it! The dough should be thicker in the middle and thin out to the edges. Dipping the knife or scraper in water helps if the batter starts to stick. 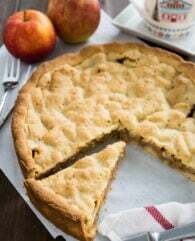 If you can’t get your hands on Oblaten use a silicone baking mat instead of parchment paper and place the batter with an ice cream scoop directly onto the mat. Use a wet knife or bottom of a glass dipped in water to flatten the batter. It’s a bit more difficult but can be done. Bake them for about 22 minutes, they should only barely brown on the edges and be soft in the middle. You want the Lebkuchen to be soft and moist and not hard and dry. After they have cooled completely decorate them with a glaze. In Germany, you can get them without any glaze, with a dark chocolate glaze, or with a sugar glaze. My favorite is the sugar glaze but the chocolate glaze is the most popular. You can also press some blanched whole almonds into the glaze. Melt 4 ounces quality dark together with 1 Tbsp coconut oil in the microwave or in a metal bowl set over some simmering water. Use a brush to coat the cooled Lebkuchen with the melted chocolate. Let the chocolate dry completely before putting them into a cookie tin. Combine 1 cup sifted powdered sugar and 2-3 Tbsp of water in a small bowl and whisk until smooth. Use a brush to coat the cooled cookies with the sugar glaze. Let it dry before putting them in a cookie tin. (Oblaten): You need about 40 of these for the Lebkuchen! They keep for a long time. are super important for this recipe! You can also make your own Candied Orange and Lemon Peel. 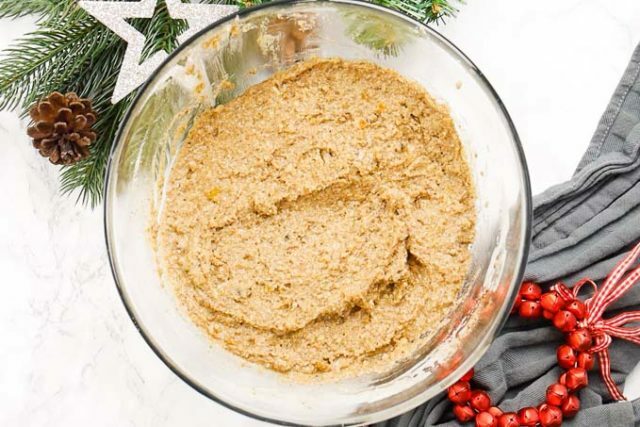 Gingerbread Spice is like the German version of Pumpkin Spice. I recommend that you make your own which is easy and much cheaper than buying a mix. Want to try this Lebkuchen cookies recipe? PIN IT TO YOUR CHRISTMAS BOARD TO SAVE IT OR SHARE ON FACEBOOK! This traditional Lebkuchen recipe is easy to make from scratch and loaded with nuts, candied fruit, and flavorful spices. In the bowl of a stand mixer fitted with the paddle attachment, combine the eggs and sugar. Beat for about 15 minutes at medium speed until white and fluffy. 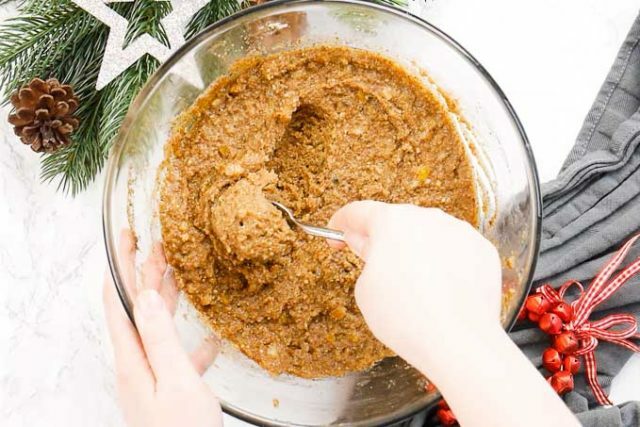 Add the ground hazelnuts, ground almonds, finely chopped candied orange peel, finely chopped citrus peel, gingerbread spice and lemon zest. Whisk until combined then cover the bowl with plastic wrap and let the batter rest in the fridge overnight or for at least 10 hours. Preheat the oven to 320° F (160° C), line a baking sheet with parchment paper. Scoop the mixture with a spoon or an ice cream scoop onto the wafers (Oblaten) and smooth down the top until the very edge of the wafer with a wet knife. The dough should be thicker in the center and thinner on the edges. Set them on the lined sheet. Bake for about 22 minutes, or until the Lebkuchen are set but still soft in the middle and have barely started to brown around the edges. Leave them on the tray to cool down completely. Once the Lebkuchen are cooled, place a wire rack over a baking sheet (to catch the drippings). Dip the Lebkuchen in the chocolate glaze and let the excess drip back into the bowl. Then place the Lebkuchen on the wire rack. Let them dry completely and store them in an airtight container. Recipe originally published December 2015. Updated with recipe video and more detailed instructions. I went to Switzerland as a teenager with my sister and dad. Our hosts there gave us some cookies they called “Swiss Christmas cookies” which were absolutely delicious. The second my sister bit into these, she said that they’re exactly like those Christmas cookies – and I agree. They’re so special and fragrant. I’ve been bugged to make them again ever since. I just made the batch and put in the fridge. However, I beat sugar and eggs for 15 minutes but with the yolks it did not turn white or get fluffy as just egg whites would. It looks just like the picture so I will bake tomorrow with fingers crossed. Can ÿou use swerve in this recepie? If it looks like the picture it should be alright! Room temperature eggs work best, the mixture should increase in volume and get lighter but it won’t get white like egg whites. I don’t think swerve will work. I just made these, the last batch is in the oven as I type. What can I say? Wow! These cookies are what Christmas tastes like. Christmas in every bite! The flavors are perfect, not overpowering. I have made these before with another recipe about eight years ago but this is THE recipe. The batter came out amazing, just like you said it would and the wet knife now makes complete sense. It was nice and firm after the chill and it did not spread in the oven. In my eagerness I ordered the wrong size Oblaten, 50 mm instead of 70mm, but I just adapted and they are still delicious. The other recipe also did not have Oblaten but I love the texture of it and how it holds the cookie together. Tomorrow the donning of the chocolate. Thank you again for this amazing recipe. Tomorrow is also my attempt with the Vanillekipferl. As the writer above reported, my cookies definitely spread when baking. The consistency looked the same, I did not have wafers and I baked on a silicone mat. They were also quite difficult to get off the matt. I am very fond of these cookies as we always had them at Christmas- my mom bought them commercially from a German baker. I have lost the closest recipe that I found and am continuing to try to find. The taste of these are quite close but I am not sure why they spread. Mine are turning out great! Batter sat overnight and was thicken enough to spread on the oblaten. They smell delicious. I’m going ice with chocolate and white glaze. Thanks for the recipe! I love this recipe! It worked so well for me and I covered them in dark chocolate. They taste better the more they age too! I have to ask, where did you get (or who makes) the cute little Swiss chalet mug in the background of your first pic? So cute! Hi, I made your Elisenlebkuchen today because my kids love the store bought from Germany. But, my batter, even after resting over night in the fridge, was not holding its shape on the silicone mat. It was not runny but it was not a stable texture. I tried to flatten them with wet knife but they still didn’t look like yours. Any advice? Thanks. If I make my own homemade wafers (Oblaten), can you give me a weight of how much I would need to use in the recipe since I can’t go by number of wafers any longer? I just got back from a week in Germany, including a visit to Nuremberg…and their outdoor market, where I bought the BEST Elisenlebkuchen! I just got the wafers from Amazon today and got all of the spices at our local food co-op to make the gingerbread spice. I’m excited to make the cookies this weekend…and will save them for Thanksgiving. Thanks for the authentic recipe! I wonder, where did you add the flour? On the ingredients list you don’t have it, nor on the instructions, so, why when a click on the link for getting the ingredients the flour appears as part of one of the ingredients…I’m confused! FLOUR – The oblaten wafers that you form the cookies on are made of wheat flour and starch. They become part of the cookie when you bake them. My niece cannot eat wheat so I’ll make a few for her without the wafers. The recipe looks yummy. Looking forward to baking them. I have had authentic lebkuchen from Nuremberg and they do have the wafers on the bottom and chocolate coating. I have most of the spices but will need to order the missing few and the wafers online. Thanks! How do you make the chocolate glaze? while stirring occasionally, until melted. Happy Holidays!